in der Geschichtsschreibung für die Konstruktion einer nationalen Meistererzählung von 1500 bis 1850. 12 Experten analysieren in 12 Einzelstudien die historiographische Präsentation von »Volk« und »Nation«, die unterschiedlichen Markierungen von Zugehörigkeit und Ausgrenzung aus der jeweiligen nationalen Perspektive und deren zeitlichen Wandel. Die Forschungsgebiete rangieren zwischen Baltikum und Balkan, den Britischen Inseln und Nordamerika. For all the development of new approaches, the writing of history continues to be strongly influenced by the national paradigm. It remains largely the product of the nation-state and its institutions. The theme of the present volume, Frontiers and the Writing of History 1500–1850, offers an unusual but illuminating perspective on these traditional national narratives. 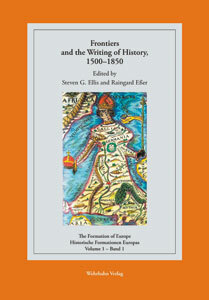 In early modern times, frontiers in their various forms constituted the margins of the embryonic nation-state: likewise in terms of history writing, both in pre-modern and modern times, frontiers marked the boundaries of the emerging national historiographies. Frequently, however, the agenda of national historians writing about 'our people' on one side of the frontier offers a very different 'take' on developments from the approach of historians writing to another national agenda across the border. For this volume, twelve acknowledged experts in frontier studies have been commissioned to write essays which explore the relationship between frontiers in pre-modern times and their representation in the various national historiographies. The essays focus on frontiers with a wide geographical spread, extending from the Baltic and the Balkans, to the British Isles, and North America.